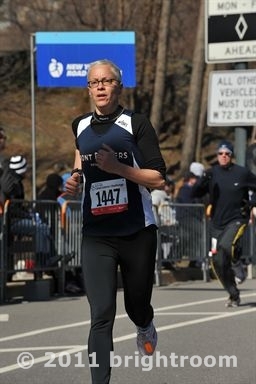 This is not my Scotland 10k photo, it is from the NYRR 4 mile race on March 27th when it was 27 degrees. Today was perfect racing weather, overcast, 51 degrees. I was well rested, felt good, and excited to run. The season has been somewhat lack luster after coming back from a long injury and this was my first 10k. I initially though I would be happy if I averaged 7:45 pace. My last 4 mile was a dismal 7:37 pace. It was warm today so I ran in shorts and a singlet which felt great. Splits: 7:34, 7:21, 7:19, 7:46, 7:15, 7:28, 7:11. The beginning was super crowded and my slowest split was Harlem hill, a good place to do some work. My garmin said I ran 6.32 miles giving me a pace of 7:26, but NYRR has me at 47:02 and a 7:35 pace which earns me a 70.3%AG baby. Gee did I run a whole 200 extra meters? I placed 13th in my age group out of 227! There were 8491 total runners in the race, 3975 women, I beat 3745 of them. I finished without one ache, without any tight hamstrings, my legs and hips felt as strong as can be. Now I can relax, do a little more track and tempo work and bring those times down. I want to climb back into the top 10. But for today, I am thrilled to be strong and healthy. Yea, life extra good today. tempo by adventureartist at Garmin Connect – Details. Ran a nice little 5 mile tempo with my friend Patrick in CP. While it may look like we were slowing down, technically we were, 7:44, 7:33, 7:56, 8:04, 8:07, 7:48, we ran the easier west side of Central Park with a lot of down hill, then the east side and cat hill which slowed us up a bit. The goals was 7:50 – 8:00 pace, in the end it averaged 7:53, but the goals was to keep it even. The intensity was even and perhaps even harder in the last two miles according my HR.